Given Table 7.7 about how much force does the rocket engine exert on the 3.0-kg payload? This is College Physics Answers with Shaun Dychko. The net work done by something equals its change in kinetic energy. The net work in this case is the force applied by the rocket multiplied by the distance over which it applies that force. At least we assume that this is the net work, we don't know whether the rocket is going up or sideways or down. 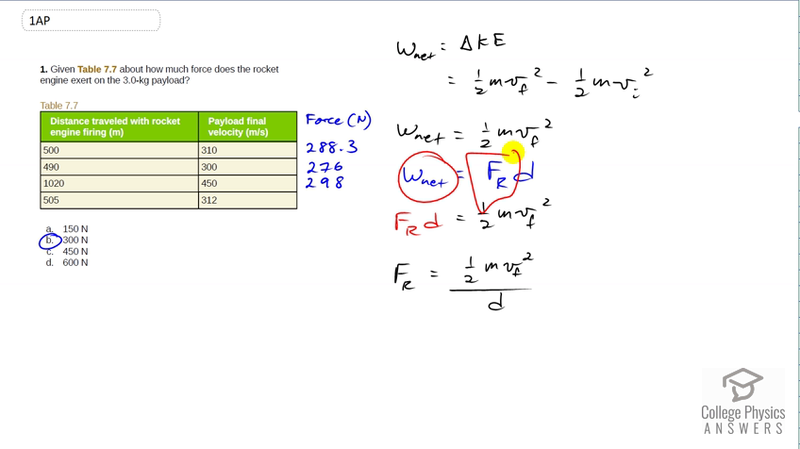 This assumes that the rocket is going sideways in which case the gravity is going perpendicular to the displacement, in which case the gravity does no work and so the net work calculation does not include it. So, or this is way out in space maybe or something too. That would be another scenario where this would be the net work. So being the change in kinetic energy that makes it one half m v f squared minus one half m v i squared. But even though the question doesn't say so, we're going to have to assume that the initial speed is zero otherwise we won't be able to calculate what this change in kinetic energy is. So it's going to be one half m v f squared in this case. So we can equate these two expressions for the net work, force applied by the rocket times the distance over which it applies equals one half m v f squared and then divide both sides by d to solve for the force due to the rocket. That's one half mass of the rocket times speed squared divided by the distance. So if you go one half times three kilograms times 310 meters per second squared, then divide that by 500 meters, you get 288.3 Newtons and 0.5 times three times 300 meters per second squared divided by 490 meters gives 276. Then again, 0.5 times three kilograms times 450 meters per second squared, divided by 1020 meters gives 298 and by this point with these three data points I think we're confident that the answer is B because that seems to be about -- B is the rounded number that is closest to these three figures. Just for confirmation you could do the calculation again with this fourth row but I think it's fine with just three. So the answer is B, 300 Newtons approximately.